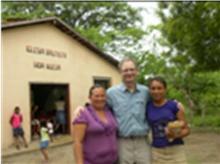 This was my first trip to Honduras with Sharefish, although I had been as an interpreter on three previous medical missions to Honduras. Chuck Nichols, aka “Pepe,” invited me. 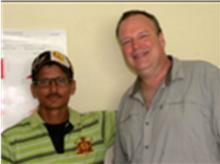 Having seen his enthusiasm for Honduras and the towns of El Carrizo and Santa Marta, I eagerly signed on. I wanted to see and experience what drove him to learn Spanish, go four times a year, correspond with Beberlyn and Keyli and be so excited about helping two towns far away, farther away in economic development than in geographical distance. Pepe is my student, and after 30 years of teaching, I can honestly say I’ve rarely seen such motivation to learn. How many lawyers, or any adults, dedicate their spare time to studying vocabulary and reading novels in a foreign language they’ve just begun to study! 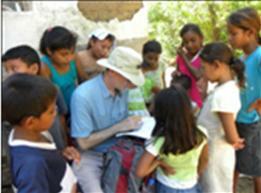 So without the least trepidation, I signed on for another medical mission trip to Honduras. There was excitement (as well as traffic problems) as soon as we landed in Tegucigalpa around 11:00 a.m. Zelaya, the ex-president forced to leave the country in his pajamas, was expected to return “any minute.” I, with native hondureños, ran to the window of the terminal with camera in tow hoping to snap a picture of his disembarking. Not to happen. He arrived around 3:00 that afternoon, with his supporters long gone. Great Latino story! [It was at the airport that this vegetarian had her first McDonald’s hamburger sans burger, and the last fresh lettuce and tomato that I allowed myself to eat while in Honduras (figuring it was safe in the airport and at McDonald’s)]. We left the capital and headed to Choluteca on what was once a US school bus. Honduras is a beautiful green country, and I loved looking at the spectacular scenery. 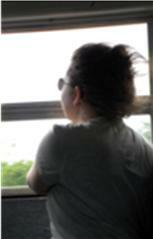 One of my favorite memories is of Ashley looking pensively out the window, loose strands of hair blowing in the wind, and taking it all in. She seemed oblivious to all else as she took in the lush volcanic mountains. I understood, because I feel the same way every time I ride from the Guatemala City airport to Antigua, where I visit once a year. Central America is incredibly beautiful. And I was delighted to find myself there once again, with happy prospects of a medical mission, a real passion of mine. On that first day, everyone received a letter from Oie. It was a beautiful letter urging us to just “Let it go,” and let God take care of everything. He urged us to dismiss any preconceived expectations. Let Go and Let God is a familiar theme to me as the resounding solution to all our problems from a previous Companions in Christ class. I felt I “knew the drill.” Through the years I’ve had the fortune to travel quite a bit in Latin America and love it. Once as I was leaving for Latin America, I told my husband: “Listen, if anything should happen to me…” He interrupted me and said, “I know. It’s like Br’er Rabbit in the Briar Patch.” I’m passionate about Spanish, Latin America and interpreting for physicians and nurses. This was my ninth medical mission. After arriving at the Hotel La Fuente in Choluteca, I soon jumped in the pool and did several laps. When I emerged from the pool, the doctors, all sitting poolside, asked if I really felt it was a good idea to swim in that murky, algae-filled water. Ouch! Too late, and one month later fortunately still no manifestations of adverse consequences. The next day was church–twice! First in El Carrizo and later in Santa Marta. Such enthusiasm! The children performed and the congregations sang their hearts out. They greeted us warmly, thanked us for coming, and we responded in kind. The faith of these people is real. Monday morning–time to set up clinic and go to work. It was my great privilege to work with Chuck’s brother, Van Nichols, a urologist from Wilmington. We saw headaches, bone aches, stomach aches, and even several urinary tract infections. Van was great! He is skilled, intuitive, compassionate, fun and explained everything to me. I learned so much working with him. His patients went away completely satisfied and pleased with the attention they got from him. Well, there was that one guy who needed muchocounseling and, after 45 minutes, we had to encourage him to seek it elsewhere. We had clinic five days, three days in El Carrizo and two in Santa Marta. The patients came with such a huge array of complaints and problems. How fulfilling it is to be able to help them and for me, personally, to be a small part of the huge contribution of the physicians! 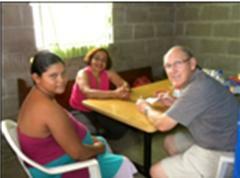 In El Carrizo, Van and I worked in the town clinic and had the help of the resident nurse, Iris. She was so kind and helpful. In Santa Marta, Van’s “office” was in the church’s Sunday school building. We worked alongside Richard Hayes, our resident OB/GYN, separated only by a plastic curtain. 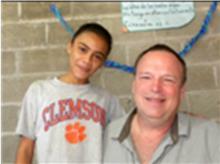 JR Rusher, was our pediatrician and Mike Glover, our orthopedist. Ashley Brown admirably handled the pharmacy with the help of Richard Ramirez, who doubled with toothbrush distribution. Tom Rusher took lots of blood pressures and did vision tests. Over the five days we gave medical attention to over one thousand men, women and children in the two villages. This was a work trip, and so we worked. But so very memorable are the faces of the people, especially the beautiful children. Are they poor? Yes, economically. But they are wealthy in so many other ways. In personality, faith, love, laughter and hospitality, they reign supreme. They welcomed us with open arms and were so grateful for the help and attention we were able to give them. There are all the little memories. One is Pepe the Pied Piper being followed by his adoring fans. He puts the best foot forward of Sharefish, which has enabled so many children to read books, go to school and, now, get medical attention. Pepe is tireless. I followed him on the first day in El Carrizo as he visited home after home and treated his “followers” to dried fruit and refrescos from plastic bags. I remember Nurse Crystal whipping out her stethoscope to listen to the chest of a little girl who had rashes. 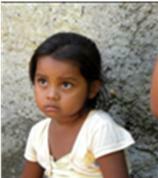 Crystal’s diagnosis was later confirmed by our pediatrician, JR, when the little girl came to the clinic. I remember having silly giggles in the hotel with my roommates, Crystal and Ashley, both younger than my own children. I remember the best coffee ever that the hotel staff treated us to in the mornings. Sugar? Never at home. In Honduras, ¡Claro que sí! The hotel chef gave me a lesson on how to cook black beans. And back home, I actually did it. They were the best I’ve ever fixed, thanks to her. I remember Van’s gift of his own reading glasses to a man who had none. He was thrilled to be able to see to read. There are countless stories and faces, each with his or her own story. I so vividly remember the young mother whose aches and pains turned out to stem primarily from her unhappy marriage. “My husband hasn’t left me yet,” she divulged as a tear started down her cheek. How else would a traveler experience such intimacy in a foreign country? A medical mission is a vehicle for getting to know and help people as they reveal their deepest, most personal concerns to strangers. The group was caring, congenial and fun. Did we make a difference? I don’t know. I hope so. One thing is certain: that they made a difference in our lives.